You probably use a keypad lock often throughout your week; instead of a key to open a lock, you punch in a code and the door is unlocked. There are many advantages to a keypad lock and many reasons to consider it for your own home or business security in New York. Often a keypad lock is more secure than a key because keys can be lost or duplicated. Businesses often use them because it's easy to change the code but not the keys when you need a new lock on your door. You don't need to worry about being locked out because you forgot your key or pass card if you use keypad locks. These can be a good idea in the home if you keep weapons in the house or need additional security for any room of the home. You don't need to give your code to the children or strangers so you know your guns or valuables will be secure, even if you need to give out your key for any reason or if the children will be at home alone. You can also change the code to your keypad locks as often you wish and not worry about making new keys or getting the lock replaced altogether. 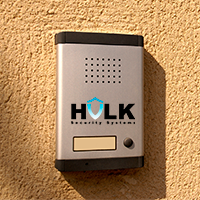 Installing keypad locks is just one of the security services offered by Hulk Security Systems. We can offer you added security in New York for the office or the home.